Meet Dr. Nicole Chodkowski. 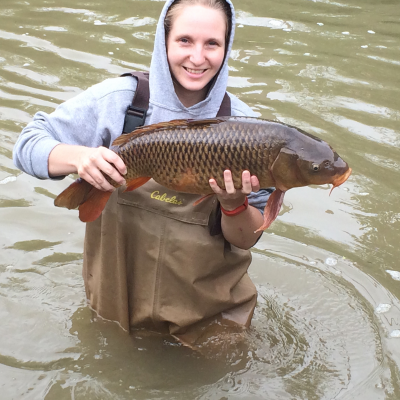 She is currently a QUBES Postdoctoral Fellow at Radford University, VA. She received her Doctorate in Environmental Sciences from Ball State University where she studied parasite ecology in aquatic ecosystems. This interview has been edited and condensed. Why is your current work in QUBES important? QUBES is an open-source educational resource community for math and biology professors, and its goal is to help faculty move away from traditional lecture-style teaching and more towards active learning strategies. Active learning strategies have been shown to improve student comprehension. So, in my role, I help facilitate professional development for faculty within this community, so faculty can both use free, curated resources for their classes, but also analyze how well they worked and report back to the community. In your role, you must have the opportunity to network a lot, do you find networking hard? What advice would you give to those who aren’t as comfortable? I still find networking to be tough. But now, I go to a lot of in person meetings and conferences having met people virtually. By making these connections first, it’s a lot easier to start a conversation. My advice for others would be “don’t be afraid to put yourself out there.” If you are interested in talking to someone at a conference it’s perfectly okay to seek someone out and say “I really enjoyed your talk on this...” and start up a conversation that way. What advice do you have for students looking for their next step after their PhD? Use your networking opportunities to promote yourself. If you know someone you want to work with is going to be at your talk, feel free to talk about the questions you are interested in investigating next at the end of your presentation. Also, make sure to be specific when applying for positions and pick up on what they are looking for, and how you can be an asset to them. What has been your biggest challenge as you’ve moved through grad school and into your post-doc? For me, it’s really been losing my network when I moved to a new place for my post-doc. In grad school I feel like I had a really good network of people that were supportive, understood what I was doing, and provided a lot of feedback. My current department has also been great, but it’s been hard to lose my direct network of friends I had during my PhD. However, I’ve learned from the experience and realized it’s nothing I can’t handle, it’s just something new that I have to adapt to and figure out what works for me. What advice would you give to your former self knowing what you know now? Make sure you are happy, and by any means make sure that happens. The work will get done, there’s always a way to manage it. It’s more important to give yourself those mental needed breaks and make sure you can stay happy with what you are doing. In my undergraduate, I struggled to even get to the gym. I kept saying “I have no time for anything.” But now, I’m even busier, and I find that time. I tell my freshmen now: reward yourself. Even if it’s a small thing like you re-wrote your notes, go ahead and get the chalupa from Taco Bell. Make sure you have smaller things every day that you can look forward to create some happiness. For me, that’s food. How have made time for your hobbies? I keep myself on a strict schedule. So, for example, when I hear that others are going hiking, I know I have to get things done so I can go, and I stick to that. Another thing that has been oddly satisfying and helpful has been putting small things on my list like paying my internet bill or going grocery shopping. Putting small things like this, in addition to your hobbies, on your to-do list can help you feel like you are getting things done while still providing that needed time for yourself. You’ve lived on the East Coast, the Midwest, and now, the South, which has been your favorite? Well, the East is my home because my family is there. I grew up on Long Island and that was a great place to live because I had access to the beach, the city, and the mountains. Where I lived in Midwest wasn’t the fanciest place, but the people there were the best – the culture was welcoming, friendly, and supportive. If you weren’t applying to be a professor, what would you be doing? If I hadn’t gone down the career path in academia, I’d probably be somewhere in the medical field because that was my original goal before I was sucked into research and ecology. But if I wasn’t doing this at all, I’d probably be road tripping around the U.S. visiting every national park. You have an adorable bearded dragon as a pet, what is the best outfit you’ve dressed him up in? They are all really adorable, but my favorite is his science outfit. A very talented former student of mine took his measurements and made him a custom lab coat with little pockets complete with Velcro and everything. 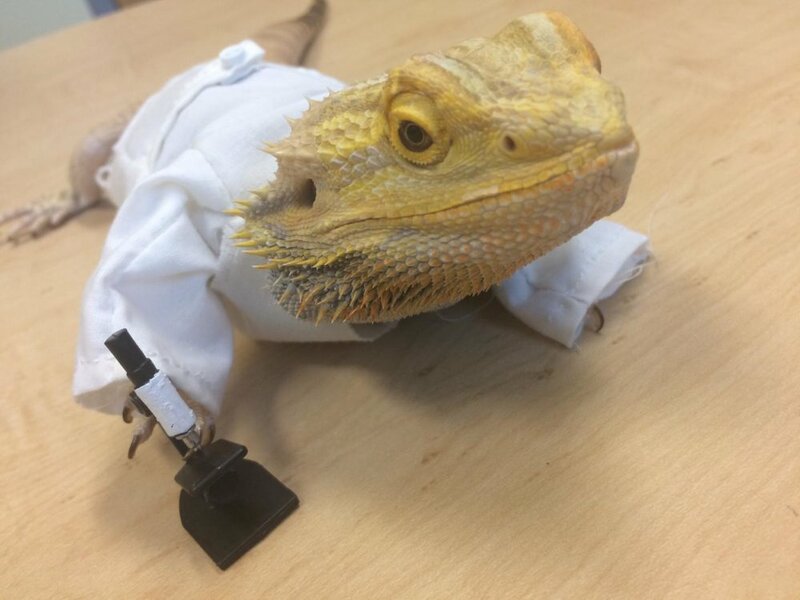 Sebastian – Nicole’s Bearded Dragon – styling in his custom-made lab coat, complete with tiny microscope.